I was so pleased with the success of my fruit liqueur experiment at the end of last year that I was keen to try out alternatives throughout the season. First up this year was the Rhubarb harvest. Perhaps not the first candidate to sprint to mind, but I was quickly reminded by the success of the Gooseberry Liqueur and set my reservations to one side. 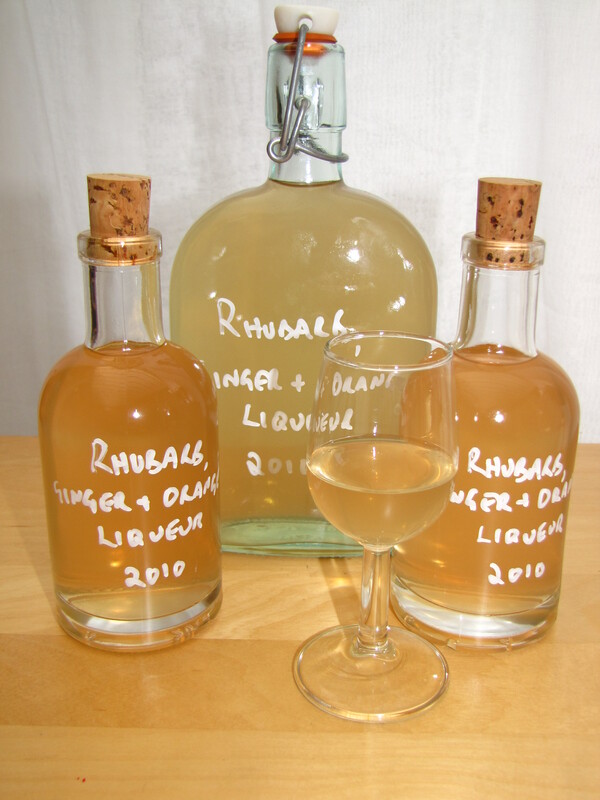 Besides, I always have much more rhubarb than I can use, and if I could pull this one off then, heh, a unique Yorkshire tipple? Brilliant… Again, this formed a bit of an experiment with 3 variations, all of which can be derived from this recipe. Sweeten to taste using the cold stock syrup. I found a ratio of 12 parts spirit to 5 parts syrup was just right for me. If desired, siphon off into smaller bottles perhaps to give as Christmas presents! This tends to leave the cloudy stuff in the last bottle, which is a good excuse for you to get in there and drink some straight away. After all, you don’t want those dregs hanging around now, do you? 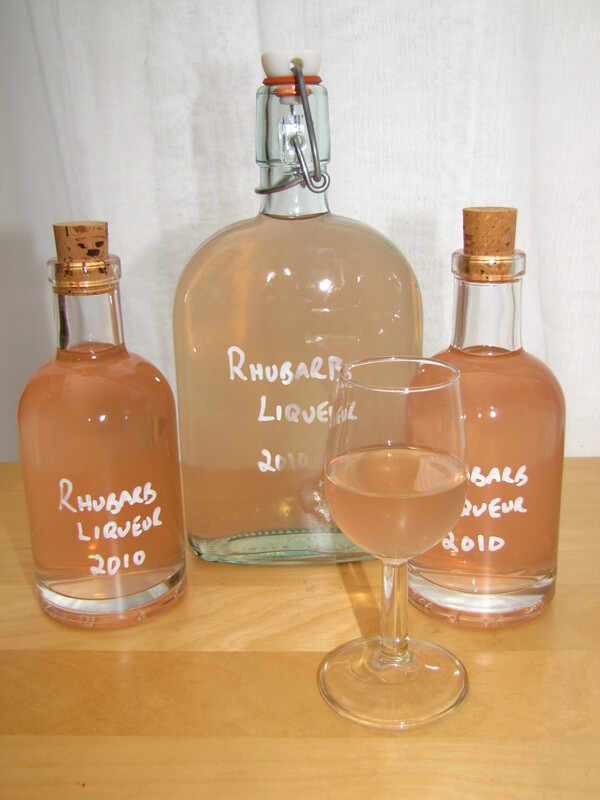 Rhubarb Liqueur, bottled & ready for drinking! The Rhubarb Liqueur is quite subtle. It has a great pink colour and a slight acidity, but by itself it doesn’t really stand out. Add the ginger, and you get an amazing transformation. Instantly warming, you get a superb balance in a drink which would be perfect for a winter evening. Add the orange, and surprisingly, the effect of the ginger is less pronounced, but the aroma given off by the zest continues to transform this drink yet again making this a very festive tipple. One recipe, 3 very different effects. Thanks for your web page — fascinating! I just learned of Aperol and want to experiment. For years I’ve made rhubarb wine. It’s quite delicious but takes a good 18 months to develop mellowness. 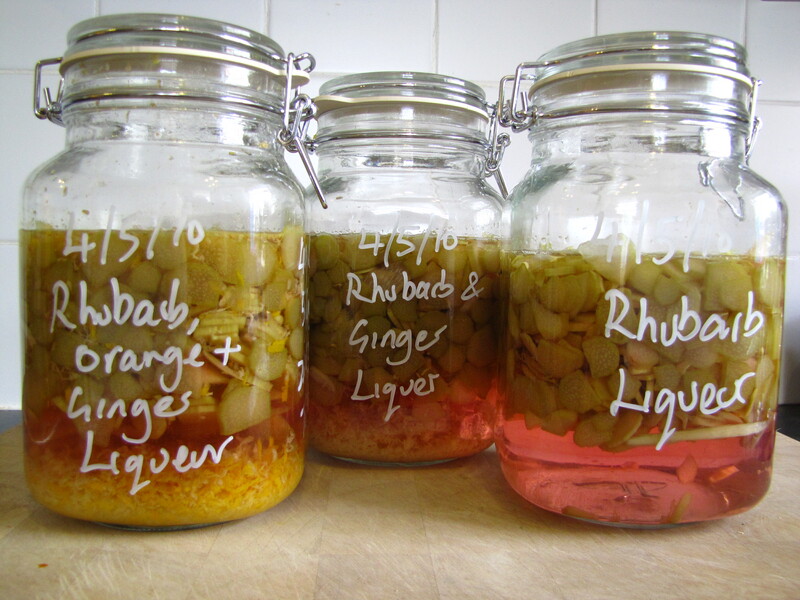 Instead of your straight maceration, I’m thinking of distilling the rhubarb wine (racked 2-3 times) rather than using vodka. This should assay out around 100 to 120 proof. Then infuse orange into the distillate for a month or two, strain through an activated charcoal filter (Brita), and adjust sweetness with a simle syrup. I’m so pleased it went down well – it’s one of my favourites! I keep experimenting (some much more successful than others) and continue to post the more successful ones here. The process is more or less the same though, it’s just a matter of finding new ingredient combinations to throw on. I like to inflict bottles on my friends & relatives for Christmas too – this year’s experiment with the Chocolate Vodka was the latest success, but designed as a spirit for a cocktail. I’m going to make this again with some sugar to make a wonderful Chocolate liqueur. Sounds yum, will have a go at this for Easter, by then my liver should at least be able to defend itself again, in the meantime, your Beef Casserole recipe is beckoning…..
What about honey, instead of sugar. Worth a try? I don’t see why not – the sugar is just there to sweeten so give it a go and let me know how you get on! Just bottled my Raspberry and Blackberry gins …… oh WOW, just WOW. 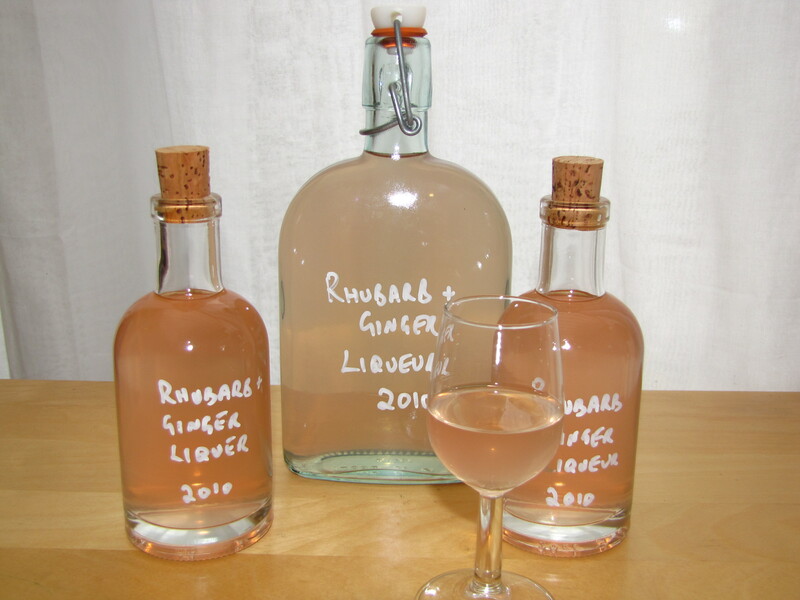 Today I am going to use some rhubarb from the freezer and make a batch of rhubarb and ginger gin (know your recipe says vodka but since I have have a couple of bottles of gin in the cupboard, guess it will be ok. Love your recipes James. That’s great Alice, I’m so pleased these are working out for you! Gin or vodka – it’s all a matter pf personal taste, just keep experimenting! I use approx 4kg Sugar to 1 ltr water – this makes quite a lot so scale accordingly!